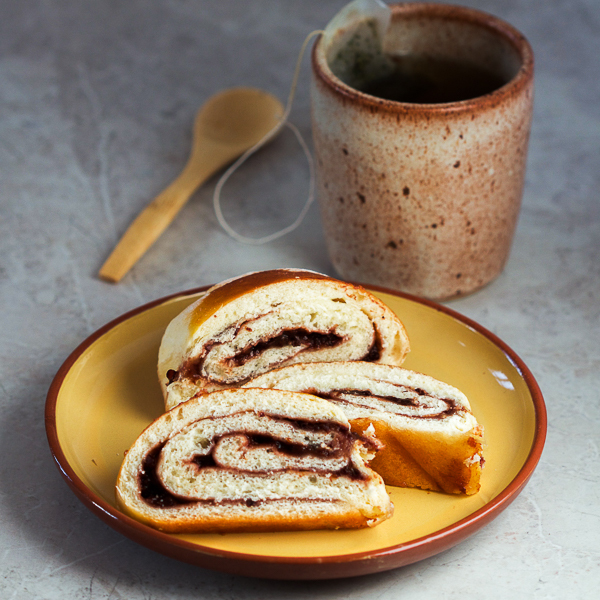 Soothe your appetite for pastries with a warm, plum jam filled strudel. All that this straightforward dessert requires from you is a little patience while waiting for the dough to rise. Perfect with a cup of tea on a rainy weekend afternoon. If I had to guess, it was probably the Austrians who brought strudel to the Balkans. Since then, it’s become a pastry staple. The main difference between Germanic strudels and Balkan strudels today seems to be dough thickness. In the Balkans the strudel is relatively thick. In other regions dough is stretched out to be the thin phyllo dough. 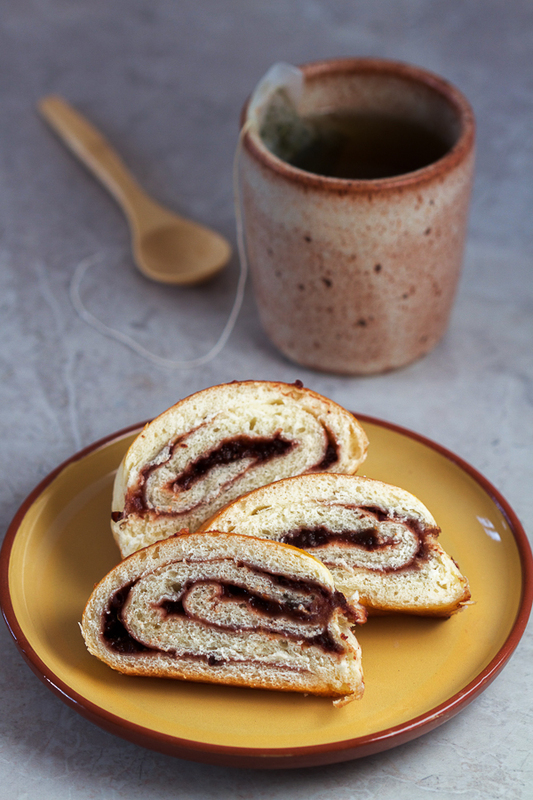 You’ve probably heard about the poppy seed strudel. It’s one of a kind. However, it causes other strudels to be overlooked. This prompted me to share with you a recipe for a different one. Equally mouthwatering, the plum jam strudel is made the exact same way as the poppy seed one, and is just as worth the patience it takes for it to rise. What is it like, you ask? Well, it’s perfectly baked dough transformed into a smooth, elastic base, filled with a tingling jam sweetness that ends in a sneaky pinch of sour. Such a specific taste can only come from plums which have been worked until their insides have given us everything. Their souls. Their stubbornness. Their green and their purple. Find the best plum jam you can for this strudel. Organic and homemade are labels you are looking for. This is, of course, if you can. If you can’t, then get whatever your grocery store is carrying. Right away you’ll notice dough for strudel is very similar to the dough for rolls and crescents. The flour is mixed with milk and butter, with a little bit of warm water. It’s left to rise for 45 – 60 minutes. 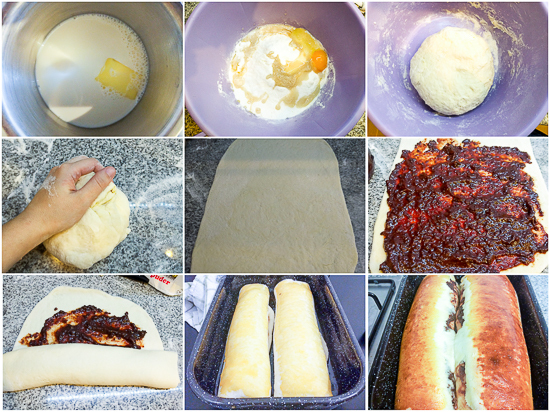 It’s then rolled out, jam is spread over the dough, and at the end the dough is rolled in. We paint it with an egg yolk, and leave it out to rise again, this time for at least 30 minutes. At this point the strudel goes in the oven for baking. Wait until it cools down before eating it. This is, of course, if you can. If you can’t, devour it right away. Combine baker’s yeast and 1/2 tablespoon of sugar with 3 tablespoons of warm water. Leave aside for ten minutes, or until it starts to bubble up. Combine milk and butter in a small pot. Heat over low until the butter melts into the milk. Leave to cool for a couple of minutes. In a mixing bowl combine flour with salt, 2 tablespoons of sugar, and 1 egg. Add the yeast and sugar mix. Start adding milk and butter in and kneading the dough vigorously for 10 minutes. If more liquid is necessary, add lukewarm water. Leave aside in a warm place for 30-45 minutes, or until the dough doubles in size. Sprinkle flour on your working area. Take the dough out, and cut into two equal pieces. Knead the first piece for 5-6 minutes. With a rolling pin, roll the dough out into a rectangle. 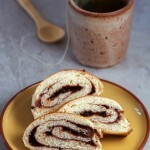 Spread about 5-6 generous tablespoons of plum jam over 3/4 of the dough. (When you roll in the dough, some of the jam will be pushed up, so the entire area will be covered.) Roll the dough in until you have a loaf. Transfer to 9×13 inch pan sprinkled with flour, placing the end side of the roll on the bottom. Repeat this process for the second dough piece. Beat an egg yolk and paint strudel loaves with it. Leave aside in a warm place for another 30-45 minutes. Near the end of this period, heat oven to 390F. Place the pan into the oven. Bake for 15 minutes, and then lower the temperature down to 350F. At this point you may need to place a piece of foil over it so it doesn’t burn. Bake for another 20 minutes. Turn the oven off, take the foil off, and leave in the oven for another 3-5 minutes. Give the strudel loaves some time to cool off before eating. ***Please note that the prep time was not included as waiting for the dough to rise requires at least 60 minutes total (the first time when the dough is just made, and the second time after the it’s filled with jam).